At Greenwich Metal Finishing, we treat electroplating as an art form. Our craftsmen are highly experienced in creating a pristine surface and will work with you to match a finish or create a completely new one. Our plating services cover all metal surfaces and are available in a variety of finishes: polished, satin, brushed, antique and weathered/distressed. We treat pieces big – chandeliers and shower enclosures – and small – flatware, tea sets and hardware – with the greatest professional care. Silver plating – restore the finish of your silver plate items – flatwear, tea sets, platters, ice buckets … and don’t forget trophies! Chrome plating – perfect for the classic boating look and for modern decors. Available in polished, satin, and brushed finishes. Copper plating – commonly used for kitchen and dining accessories. Available in polished, antique, and weathered finishes. Brass plating – restore the finish on hardware, as well as on brass bed head– and footboards. Available in antique, polished, satin, and brushed finishes. Nickel plating – used for lighting fixtures, bath fixtures, and hardware. Available in polished, satin, brushed, antique, and weathered finishes. 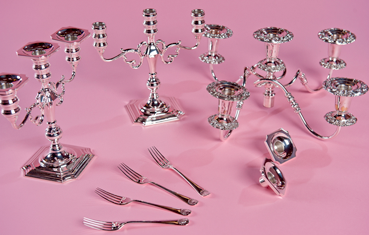 Pewter plating – a popular finish for antique items. Available in antique, polished, satin, and brushed finishes. Gold plating – 14K electroplating enhances the warmth and luxury of your treasured items. Available in polished, satin, and brushed finishes. Greenwich Metal Finishing performs all work on-premise to assure complete control and prompt turnaround. We carefully package finished pieces to keep them secure and unblemished. Pickup and delivery services are available within Fairfield, Westchester, and Putnam counties, New York City, Northern New Jersey, and Long Island. If you are outside our local area, we can arrange professional crating and transportation. For examples of our plating services and before-and-after photos, please view our portfolio.